Making repair decisions for your home’s roof should never be taken lightly. Full scale roof replacements can a complex undertaking and are generally more expensive than simple roof repairs. Deciding between a roof repair and a roof replacement can be performed in concert with a roofing contractor that will help you make the proper decision. Examining your roof’s shingles is a good place to start. If a few shingles are torn off or damaged, simply getting replacement shingles may be the answer as opposed to a new roof. Be aware, however, that you may have trouble finding shingles that match your roof. You may have to contact a contractor to order shingles for your roof. Should you be up for walking across your roof, be aware of the roof’s hardness beneath your feet. A roof that feels spongy indicates a weakened structure, possibly from moisture or rot. To be certain, ask a professional to take a roof walk. Also get the attic examined for possible breaches. Small leaks can be patched up with some roof repair, but if you have structural problems, a full roof replacement may be in order. Home roofs also have natural lifespans. An asphalt shingle roof can be expected to last from twenty to twenty-five years before it has to be replaced. Even if the roof problems are slight, your contractor may recommend that it’s time to replace the whole thing just based on the roof’s age. Check with your home’s records to get a date on when the roof was installed. Finally, consider how long your repair job is likely to last. Don’t just compare the price of a roof repair versus roof replacement. 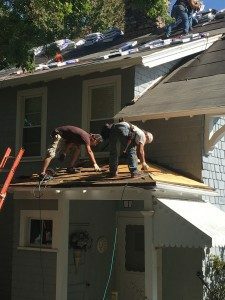 If you foresee that the fix won’t last and you’ll need additional maintenance, you may as well get a new roof, even if it costs a little more. These factors will inform your decision to repair your roof or outright replace it. Make sure, however, that you have an outside point of view that is experienced in roofing repairs and construction to give you expert advice.